On a hot, summer day, eating Rocky Road ice cream is a cool choice. But lactose intolerant Islander feels it is “safer on her system” to eat a slice of Rocky Road cake because the dairy content in it is less than in Rocky Road ice cream (although there is a little bit of cream used in the chocolate frosting). The cake is also less likely to melt when sharing it with others at summer socials. 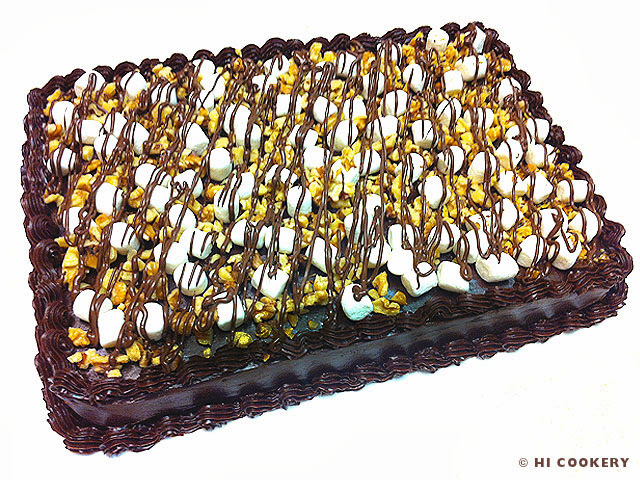 Rocky Road cake is easy to make, and the textured topping give this decadent dessert a “wow factor”. Instead of the ice cream flavor, try Rocky Road cake to celebrate the summer season as well as observe National Rocky Road Day. 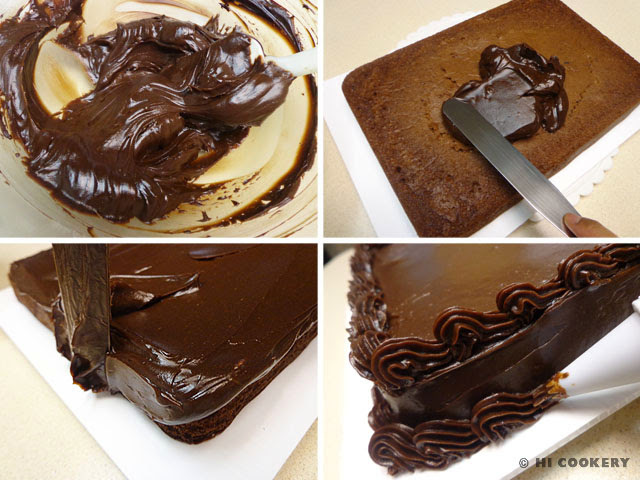 Bake the chocolate fudge sheet cake in a 9×13” pan. Cool completely. Make the chocolate frosting by melting 10 ounces of chocolate squares, stirring in a half cup of heavy whipping cream and incorporating 1 ½ cups of sliced butter pieces until smooth and well blended. Allow the frosting to cool for a spreadable consistency (several hours at room temperature or 15-30 minutes in the refrigerator). Stir before spreading on the top and sides of the cake. Pipe decorative shell borders on the top and bottom edges of the cake (optional). Sprinkle mini marshmallows randomly on top of the cake. Chop the walnuts roughly and toast them in a small skillet over medium high heat for about five minutes, being careful not to burn the nuts. 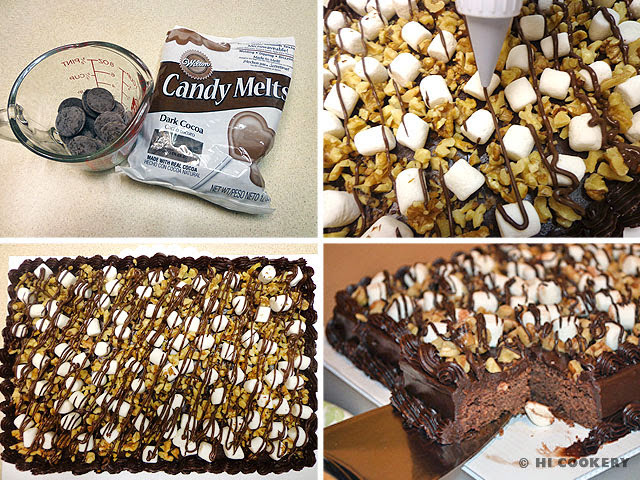 Cool and scatter them on top of the cake, filling in the gaps between the marshmallows. Melt chocolate candy wafers/chips. 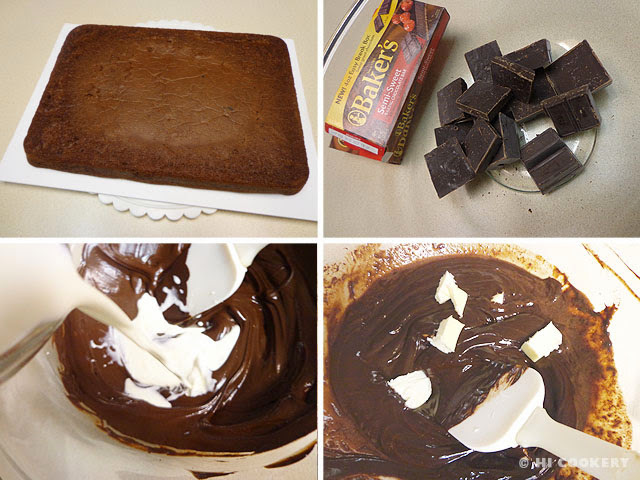 Put the melted chocolate in a piping bag with a small round tip (or fill a plastic zipper top bag and cut a small hole). Drizzle over the top of the cake. Let set. Slice the cake into 24 squares and serve. For a quicker version of this cake, use a boxed mix and canned frosting. Sprinkle pre-chopped nuts and substitute the melted chocolate drizzles for semi-sweet chips. Transform this cake into truffles. 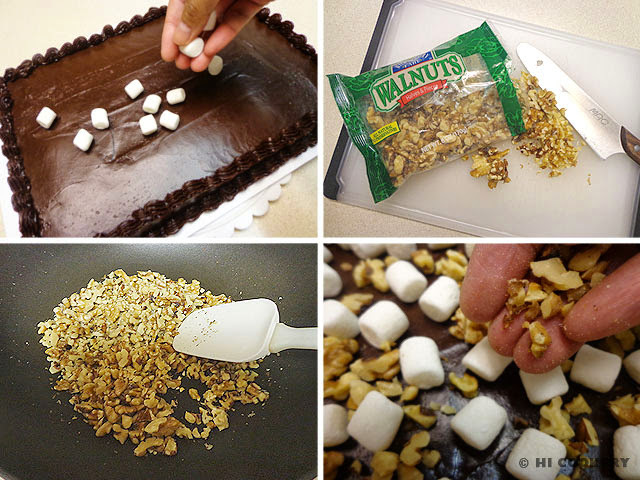 See our blog recipe post for Rocky Road Cake Truffles for another delicious dessert on National Rocky Road Day. Nuts for Nutella? Add the creamy chocolate hazelnut/filbert spread as an ingredient in Rocky Road Nutella Treats, a recipe we blogged about on World Nutella Day (February 5).